When planning to install a new floor in your home, concrete was probably not even on the list of options. Long considered only viable for basements and industrial buildings, this material has become increasingly popular with homeowners in recent years. Before deciding whether concrete is right for you, there are numerous considerations to take into account. Due to the various qualities of a concrete floor, you may find yourself weighing the pros and cons more than you would traditional flooring options. Certain factors, such as cost or hardness, may play a major role in your decision. As with many other home improvement options, your final choice may come down to a matter of personal preference. Available in more color options than basic gray, concrete has a simple appeal and may also be painted to match a room’s changing decor. However, paint is prone to chipping and other damage in high traffic areas. During installation, you may choose to have the floor stamped to resemble other materials. When redecorating, another option is to use area rugs which match your new wall and furniture choices. In many cases, you may find the concrete edge around an area rug to be an attractive feature. Concrete is a recyclable material and does not require staining or other types of finishing. It remains cool during the summer, and absorbs solar heat in winter, helping to reduce your energy bills. It is immune to termites, dust mites, and other pests. Finally, unlike synthetic carpets, concrete contains no Volatile Organic Compounds (VOCs). These factors essentially give concrete floors a zero carbon footprint rating. Concrete is a long-term investment, and therefore the initial price of installation tends to pay for itself in time. You may expect to pay an average of $17 per square foot for the pouring and any decorative finish. Despite this, your new floor will last indefinitely with only minor maintenance requirements, resulting in an investment that pays for itself over the years. Unlike other options, concrete doesn’t hold onto heat efficiently, so it will always feel cool to the touch. Additionally, the hardness may cause discomfort when standing on it for long periods of time. You may find adding area or throw rugs will help reduce both of these issues while adding to a room’s design, although this is not an option for those who prefer an uncluttered look. Compared to other types of flooring, concrete is the undisputed leader in durability. Able to withstand the weight of a large vehicle without sustaining damage, your concrete floor cannot be scratched or marred by heavy furniture and foot traffic. The only potential weakness comes from water damage, and even this is negated by properly maintaining your floor. Maintaining your concrete floor is a very simple process, although the frequency in which you must maintain your floor will vary based upon the amount of traffic it receives. By waxing or sealing the floor every three to nine months you will keep it waterproof and free of cracks. Furthermore, any neutral cleaning product will work for washing the floor, permitting you to use all-natural cleaning products. Although concrete is highly resistant to damage, it must remain properly sealed to avoid water-based issues. When water enters cracks in the floor, it raises the risk of mold or mildew. Mold is a major health risk, and removal is often very time consuming. Even worse, the water may freeze in cold conditions, causing further cracking or damage to the floor. Concrete is a very hard surface, and as a result, falls may result in more serious injuries. For this reason, it is often not recommended in homes where there are small children or elderly present. This same hardness provides more structural stability, which helps prevent structural instability from taking hold over time. 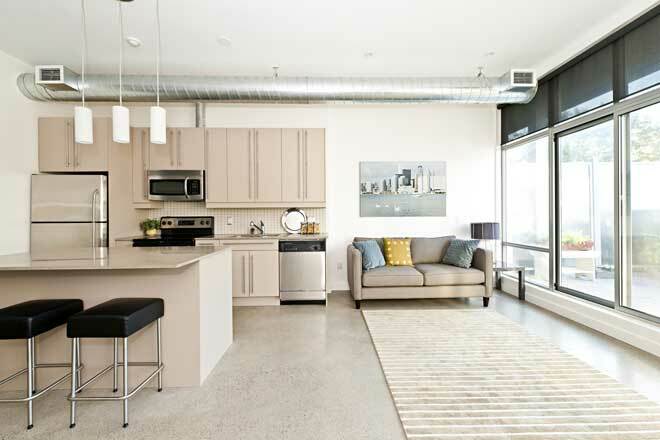 While the idea of a semi-permanent floor may seem daunting at first, concrete holds several design benefits over other flooring options. For example, you may already have a concrete sub-floor, in which case installation isn’t necessary. Simply remove your current flooring and you’re finished. Likewise, if you decide you want a different type of flooring material, simply install the new floor on top of the concrete. Concrete floors are prone to producing a large amount of echo when carpets or other buffers aren’t used. However, they may be stamped or stained to resemble floorboards, limestone, marble, and other more expensive or fragile floor options. Finally, proper installation is messy and a project which should be handled by only the most seasoned DIYers, so you may need to consider the cost of a contractor when planning for a concrete floor. Concrete Network provides an in-depth guide on the pricing of concrete floors, as well as a breakdown of how these price averages are affected by various factors you may not have considered. DIY Network gives a visual walkthrough on installing a concrete floor. While aimed towards basement flooring, the guide provides a basic idea of the process involved if you are planning to tackle the project yourself. Pro Referral offers another useful guide on the cost and process of various poured concrete projects including floors.